A restaurant car on the Tsar’s Gold Train chugging through Siberia. A journey across Russia on the Trans-Siberian Railway is epic, yet very intimate. Our train rolls for languorous days through Siberia, which covers nearly a tenth of the planet's land surface. Russia always evokes vastness and my week-long trip through its wild, wild east in Siberia appears to be all far horizons. Yet, our private train is also a cosy capsule of civilisation that stops for little local pleasures - a lakeside barbecue in a hamlet, a musical soiree in the manor of an exiled 19th-century aristocrat and dinner at a family's dacha or summer house. 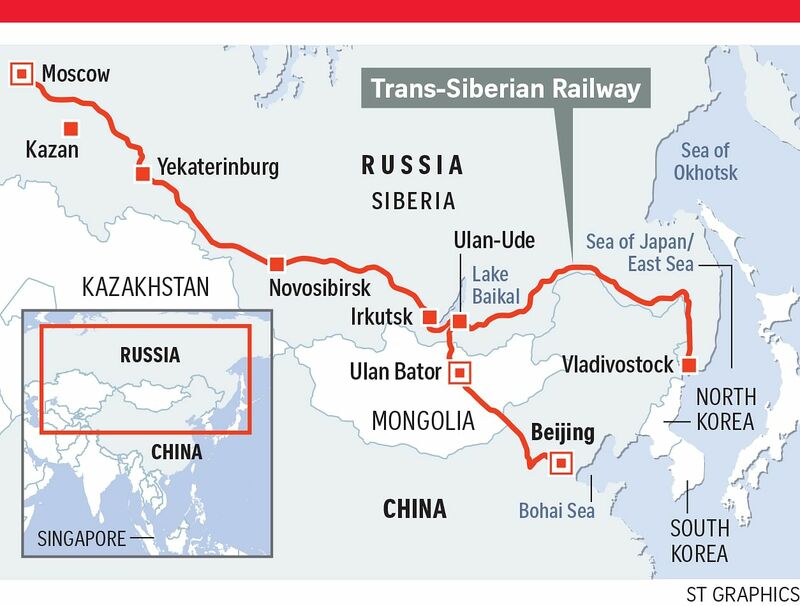 I am on the Tsar's Gold Train that runs 7,923km from Beijing to Moscow in 11 days. I have asked for a seven-day ride of 5,048km to focus on the classic Siberian route, however, so I join the train at Irkutsk, deep in south-central Russia. In late September, our train passes silver birch forests and scenes of early snowfall, Lake Baikal with its pure glistening water and the ancient, eroded Ural Mountains - but it does not trundle non-stop to Moscow. We alight almost daily for excursions that reveal a Siberia many of us do not imagine. While Siberia can conjure up frozen tundra and terrifying Stalinist labour camps in the gulag, it is not a place of nothingness. The Church of All Saints (above) in Yekaterinburg. Here, colossal cities with wintry names such as Novosibirsk and Kazan, their beauty and culture rivalling St Petersburg and Moscow, rise dreamily. The eyes of the world will soon be on remote Kazan and Yekaterinburg in Siberia - among the 11 Russian cities that will host the 2018 Fifa World Cup - and the behemoth soccer venues are pointed out with patriotic delight by our local guides. Ahead of star footballers, a number of artists have found their way to the interior of Siberia, with singer-composer Elton John performing in the flamboyant TatNeft Arena in Kazan two Christmasses ago. I also spy a dark-green luxury condominium topped by three helipads, cheekily nicknamed the House of Shrek by Kazanites and possibly an abode of oil barons in a region awash with petro-dollars. If some of this feels surreal, the cities possess a soothing cafe culture as well. In Novosibirsk, in a hip cafe with smiling Englishspeaking baristas and free Wi-Fi, I savour a moment of solitude as I sip steaming mocha and post photos on Facebook of the Siberia I am discovering. Siberia, notably Novosibirsk, is leading Russia's gourmet coffee revolution, thanks to San Francisco businessman Christopher Tara- Browne, who hightailed it to Siberia 20 years ago and started up Traveler's Coffee across the country. While World Cup madness, helipads and caffeine - along with 10- lane roads inside rich, organised cities - are some current images of Siberia, it certainly abounds in sights that are classic and symbolic in the cities I spend several hours in. In Irkutsk, I discover a figure who personalises the tumult in Russian history. There are echoes of epochs past when we step into the small manor of exiled Prince Sergei Grigorievich Volkonsky (Volkonsky House Museum, per Volkonskogo 10, Irkutsk; admission 200 roubles or S$4.40). Idealistic young officers like him who pushed for liberal reform, including freedom for serfs, had protested against the ascension of Tsar Nicholas I during a failed Dec 26, 1825 uprising in St Petersburg. Five leaders in this Decembrist revolt were hung - and the other nobility were sent to Siberia. Courageously, the wives of young married officers, Major-General Volkonsky included, chose to follow the men into the unknown. Siberia was barely populated by criminals, upstart serfs and, at various points in time, farmers who were incentivised to conquer the land along with priests - plus Trans-Siberian Railway workers whose numbers peaked at 90,000 in 1895. In this harsh milieu, the aristocratic Decembrists, the most famous exiles, along with other sad streams of political prisoners through the tsarist and communist years, left transforming touches on Siberia. I fly to Beijing, then catch a flight on Russia's domestic S7 Airlines to Irkutsk in south-central Siberia. From there, I start my Trans- Siberian Railway journey westward to Moscow on Tsar's Gold Train. My trip is the condensed nine- day Irkutsk-Moscow portion of the fuller 14-day Trans-Siberian trip that starts in Beijing, traverses northern China and Mongolia, then arrives in Irkutsk to cross Siberia into Moscow. In my case, my time on the train is about seven days across Siberia. It is bookended by a night in rustic Listwjanka near Irkutsk and another night in Moscow. I fly home from Moscow. to September. The "hotel-train" trundles from Beijing to Moscow, or vice versa. A trip starts from $9,200, depending on the cabin class. The price includes full-board meals, land tours and accommodation on the train and in cities. Other train journeys next year from Paveway include Namibia to South Africa in 15 days (March and November) and the Silk Route in 13 days covering Turkmenistan, Uzbekistan and Kazakhstan (March, April and October). They taught children mathematics, practised medicine in villages, brought culture to public places and even shared pineapple- growing skills like Volkonsky did. His wife, Princess Maria, started a musical salon in their home and to this day, Irkutsk is the Paris of Siberia. On a pitch-perfect note, our sojourn in the manor ends with a mini concert that takes us back in time to her salon. In an intimate room with velvety chairs, candles are lit and we listen to professional singers and musicians, and sip champagne. One richly romantic duet is titled Do Not Tempt Me Without Any Reason. And so in a style at once legendary and personal, my encounter with the Volkonskys has revealed Irkutsk, and Siberia itself, as a repository of dashed hopes that unfolds into a redemptive story. Elsewhere in Irkutsk, our first Siberian city, I like the local market peddling pine-nut butter, salmon roe and other rustic delicacies; and the misty Angara River on a limpid- grey day when the autumn temperature hovers at 7 deg C.
There are also many glimpses of the mythical Babr, depicted on the city's coat of arms as a Siberian Tiger holding in its mouth a sable; its fur is so precious that Siberians call it "soft gold". Travelling further west towards Moscow, I see another two storied Siberian cities that rise seemingly out of nowhere. Yekaterinburg and Kazan embody several contrasts: old and new Russia, for instance, and the European and Asian sides of the country. Yekaterinburg - elegant, jazzinfused and once named an Ideal City by Unesco - is famous as the place where Russia's last tsar, Nicholas II, was clandestinely executed with his family and staff by Bolshevik revolutionaries in 1918. We visit a replica of the sombre cellar where the death sentence was read to the tsar, now canonised by the Russian Orthodox Church. On the site a gold-domed church now stands and I am struck by its fulsome name that captures some of the bloodiness and glory of a vanished era of Romanov emperors: The Church on Blood in Honour of All Saints Resplendent in the Russian Land. Its shorter name is Church of All Saints (34a Tolmachev Street, Yekaterinburg 620000; free admission). Just outside Yekaterinburg is a more uplifting place. I am at the border between the European and Asian halves of Russia. Our ebullient young guide Natalya Domracheva calls it a border that unites rather than divides. We clink champagne glasses and do touristy poses in front of a simple monument with a stylised "E" for Europe and "A" for Asia. Along the way, Ms Domracheva tells stories that add texture to our visit. The late Russian president Boris Yeltsin, a son of Yekaterinburg and a sportsman, once coached the women's volleyball team of "stubborn Ural girls". There is a whiff of Russia's days of propaganda when she recounts: "Till the 1980s, the Russians were told or taught that the rest of the world was starving and Russia was prosperous and the best." But, she also recalls the cold reality: When she was a schoolgirl, her mother sometimes roused her sleeping children to pick up items being discarded by the supermarket. Facing similar troubles, and worse, was Kazan, the thousand-year-old capital of oil-rich Tatarstan, a republic in Russia. Ivan the Terrible, who reigned fiendishly from 1547 to 1584, subjected its Muslims to forced baptisms. But the city is now an ideal of harmony. With a population of 1.2 million people, Kazan is composed of Tartars with Turkish roots (50 per cent), Orthodox Christian Russians (40 per cent) and a rainbow of 150 nationalities. Every fourth marriage is mixed. Kazan is a reminder that Russia itself is far from homogenous. Inside the walled Kazan Kremlin (www.kazan-kremlin.ru), I notice, in the same glance, the contemporary Qolsarif Mosque and the five- century-old Annunciation Cathedral. They exude a spirit of amity that impressed former United States Secretary of State Hillary Clinton during her 2009 visit. I love the sweeping skyline of Kazan from across the Volga River, where luxury apartments emerge and the Palace of Agriculture with its opulent bronze tree divides public opinion about the new Russian standards of beauty. The new palace makes me imagine a modern fairy tale starring oligarchs, but it does not offend me. We wander in the Kremlin and also in an enclave of wooden 19th- century Tartar houses, on Kayuma Nasyri Street, with fanciful colour combinations such as a peach facade with bold green and blue trims. We enjoy another private concert, by soulful gifted children. In a park, we chant "goika" to a passing couple in wedding finery to urge them to kiss. Later, on my own for an hour in the city, I walk under an extraordinary twilight-blue sky that feels as endless as Siberia. The limitless sky, at Lake Baikal, meets the steely-blue water of the world's biggest and deepest lake, which amazingly holds 20 per cent of the Earth's fresh water. For half a day, our train slows down along its shore and I wonder about the unseen creatures unique to the lake. I wish I can spy the world's only freshwater seals cavorting in the lake, like the pair I see swimming in a natural history museum in Listwjanka, near Irkutsk. The seals, looking like whimsical, spherical missiles, feast on bizarrely pink, scaleless golomyanka or "oil-fish". I think our planet will never run out of little lost worlds like Lake Baikal. Along the lake, I get to stand on the outside of the locomotive which slows down for a spell. It is a sensation of autumn hues and crystal lake, chilly air and mile-high mountains in the distance - but I am also aware of the train as a powerful, roaring, hissing metal maniac that is classy inside. There are few signs of human habitats till we stop at the hamlet of Palavinaya, amid sunset-tinged mountains, where the train crew set up a barbecue. Our silent train and a red foot-bridge form parallel lines of engineering in a softly contoured landscape. A few brave souls step into the icy lake but, as accordion music plays, most of us start on the shashlik or grilled meats, piquant Russian salads and vodka under the most beautiful moon of the year. A Malaysian in our group, a baker's dozen of 13 fun-lovers from seven countries, remembers that it is the Mid-Autumn Festival. On the train, the exploration does not stop for we have a vodka and caviar-tasting afternoon in the dining car. We learn clever toasts - "May the best day of your past be the worst day of your future" - and try to sing Russian songs. On our tables are various vodkas of 40 per cent alcohol content, including a cranberry-tinged version that I enjoy. We snack on salmon caviar, smoked fish and boiled potato slices. The train serves an abundance of Russian food at each meal and we are replete each day with new experiences in and outside the train. In a day of prevalent air travel, the Trans-Siberian train offers travellers the gift of space and time. The speed - about 110km an hour on our locomotive, though this slows down to 60km an hour when we count the stops - is gradual enough for me to sense I am crossing immense distances in Russia. The experience of train travel has not changed much in essence from a couple of centuries ago. We still speed through the night on an improbable iron ribbon and wake up in a different place or time zone, retreat behind closed doors to read and make strangers our friends. As time slows down pleasurably, we look at the world anew as a prodigious and also very personal place. •The writer was a guest of Paveway Explorer Holidays. The Tsar’s Gold Train is a cruise on wheels where travellers are cossetted. As the Siberian landscape flashes by, I relax in my cabin and soon, one of the conductors in my carriage, Pavel or Olga, who share a round-the-clock shift, is sure to ask if I would like tea or coffee. It is cosy inside my 5.5 sqm cabin that comes with a sofa and a smaller seat across a little table. Everything is diminutive, including my wardrobe and bathroom. At night, the conductor swiftly pulls down a fluffy bed from the wall. The first night, I am still getting used to the rolling motion of the train and my sleep is splotchy. Other nights, I rest well. Full-board meals in the ornamental dining cars tend to be richly Russian and I love the bracing soups topped with fresh dill and sour cream. There is a cash bar, a mini library and a doctor is oncall. At full capacity, the private train carries 207 passengers and has 21 carriages measuring 580m, longer than a 400m running track. Our train, making the last journey of the May to October season, has 20 carriages. It takes me 15 minutes – and I open and close multiple doors –to traverse the train end to end. The train is managed by a German company and staffed by Russians, combining German organisation and Russian improvisation. This kicks in when a married couple, experienced travellers, do not notice our train leaving after a brief stop at a rustic station. Later, they recount that the Russian station master swung into action. They were deposited in a cab along with a station staff who communicated continuously with our train on his cellphone. The cab driver raced to catch up with the train, even crossing two tracks. About 40 minutes later, the duo was reunited with the train. The train-chasing episode unfolded so smoothly that other guests were none the wiser. But much of our journey is tranquil. With the wilderness outside and my book companions – Snow In May, a set of Russian short stories; plus an anthology on the railway–I am contented. I love a luminous line in the anthology, penned by Lesley Blanch in her 1968 book, Journey Into The Mind’s Eye. Since childhood, she had dreamt of riding a fabled engine across Siberia – “a secret landscape of longing which glides before our eyes between sleeping and waking”. Meanwhile, it is restful for me to travel westwards. Starting my journey in Irkutsk, which shares the same time zone as Singapore, I do not endure jet lag. And each time the time zone changes by an hour or two in Siberia, I sleep that bit more on the train. Beginning my trip from Moscow may be a different story. Onboard, our German tour director Hans-Joachim Bobsin, who speaks six languages, gives short lively talks on the public address system, including in fluent Mandarin for a private group of affluent Chinese friends. His topics include the conquest of Siberia, a huge promised land saturated with minerals and, significantly, oil and gas. He previews the gleaming Siberian cities we will visit for up to a day. The tours are excellent though independent travellers will wish to linger. And he focuses on the Trans- Siberian Railway, including the phenomenal difficulty of building the world’s longest railway in a land of mighty rivers and extreme winters. The 9,259km track links Moscow to Vladivostock, seven time zones away in the Russian far east. It has four branch routes, including to China. Under the last tsar, Nicholas II, the Herculean construction began in 1891 from both ends of Russia and was completed in 1916. Most days, we alight for city excursions, short stops in hidden corners of Siberia and, once, a barbecue in a hamlet. Passengers are organised into groups, mainly by language, and our spirited Red Team, a baker’s dozen of 13 English-speaking travellers from seven nations including Belgium, the United States and Britain, has a dedicated guide, Mr Valeri Pinizhaninov. Mr Bobsin says the train’s mission is to reveal Russia. “The Cold War is over and it is not over,’’ he says, indicating that many do not see the real Russia. He is heartened that guests leave enlightened. One of them is retired Malaysian developer Yee Oy Chong, 75, who has enjoyed cruises for years with his wife. “Everything is new to me. I thought Siberia was empty, with nobody, but it’s developed and we enjoy the scenery,” he says.